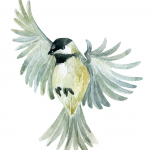 The Chickadee Nest was started to provide a place where tricks of the homeschooling trade can be shared, along with a few recipes, life lessons, encouragement, and other fun stuff like gardening and travel. You’ll find posts about intentional living, promoting peace at home, the importance of making family “rememberies,” but most importantly, honoring our Creator God & Savior Jesus Christ every day. Thanks for joining me here on this journey. Feel free to drop me a line or three, I would love to get to know you!